Earlier this month, U.S. President Barack Obama ordered the intelligence community to conduct a full review of the 2016 presidential election before Donald Trump is inaugurated on Jan. 20, 2017. The move came amid growing suspicions that Russian intelligence agencies were behind the recent hacking of email accounts belonging to members of the Democratic National Committee and presidential hopeful Hillary Clinton's campaign manager, John Podesta. Though many people's computers have been compromised before, the fact that the attack targeted prominent political figures during a presidential race - and that tens of thousands of emails gained in the process were then posted to WikiLeaks, an organization with clear connections to Russian intelligence - has caused an uproar. Many have accused Russia of trying to damage Clinton's campaign to give Trump a leg up. In fact, some figures, including Democratic Sen. Harry Reid, have even charged Trump and his advisers of being complicit in the operation. Trump's supporters, on the other hand, have denied his involvement in the hack, arguing that the Democrats are merely sore losers hoping to undermine Trump's presidency or overturn his victory. Some have even accused the Obama administration of orchestrating the hack, given the problems these accusations are causing for Trump. This is due to the emphasis having been placed on counter-insurgency and counter-terrorism operations experience that the COAS-designate Lt Gen Bipin Rawat possesses. The supersession of Lt Gen Pravin Bakshi and Lt Gen PM Hariz for the appointment of Chief of Army Staff (COAS) has the potential to widen the chasm which exists lately between the officers belonging to the Infantry and other arms, most notably, those belonging to the mechanised forces. This is due to the emphasis having been placed on counter-insurgency and counter-terrorism operations experience that the COAS-designate Lt Gen Bipin Rawat possesses. 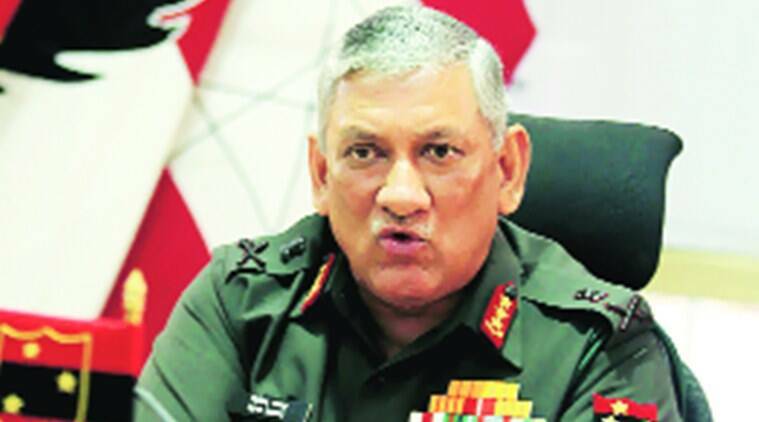 An impression has been sought to have been conveyed by the government that since Lt Gen Rawat’s service profile had extensive experience of the counter-insurgency operations in Jammu and Kashmir and also because he had commanded a division in the strife-torn state, he was, therefore, more suited for the apex Army job in the current security scenario of the country. Jettisoning seniority principle without creating a better selection process could hurt civil-military poise. 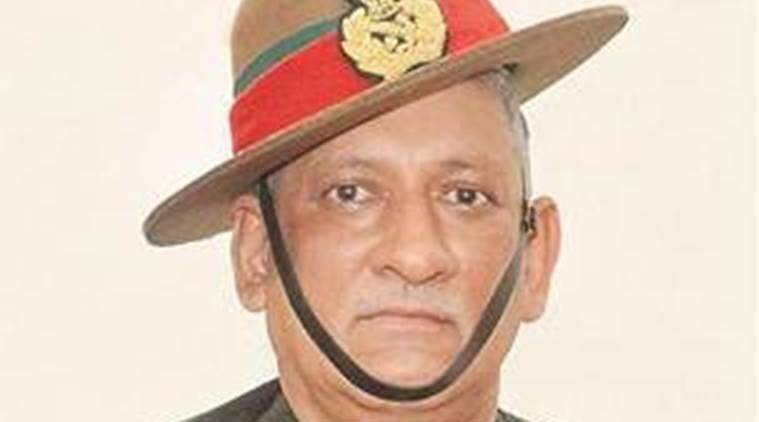 It is an occurrence so rare in India that the announcement of Lt General Bipin Rawat as the new army chief by superseding two of his seniors — Lt General Praveen Bakshi and Lt General P.M. Hariz — was bound to cause controversy. In principle, there can be no argument with the civilian government choosing an army chief it finds suitable considering the prevailing security environment and requirements. That is the essence of civil-military relations in a democracy, and a principle followed in most modern and mature democracies. Seniority cannot be the sole determinant for any post in any modern organisation, including the military. But things have been different in India, and a lot of this flows from the experience of the 1962 India-China war. Among the many lessons learnt from that military debacle by the political leadership, particularly the first post-1962 defence minister, Y.B. Chavan, was that he should have a hands-off policy towards all the operational issues pertaining to the defence services. The insularity from political influence got even stronger with the passage of time, and such has been the situation that the political leadership now only deals with the army chief — or, at best, the director general of military operations — when it comes to the army. This means that even the army commanders of operational commands, whether it be the northern command looking after Kashmir or eastern command involved in fighting insurgencies in the Northeast, rarely get to interact directly with the political leadership. The last 24 hours, I have witnessed all three — speculations, perceptions, and opinions, about the appointment of the new Chief of Army Staff (COAS). I am a mixed bag of feelings. Not because Lieutenant General Bipin Rawat becomes the 27th Chief of Army Staff, while to Lieutenant General Praveen Bakshi and Lieutenant General PM Hariz. I am sure all three are equally capable of doing good for the institution of the Armed Forces. The mixed bag of feelings is because of the reactions I have witnessed, ranging from “sad day for the country” to “anti-armoured Corps lobby” to “Police/Central Reserve Police Force/Border Security Force, controlling the appointment of the Army Chief”. I write as a common citizen, who is deeply interested in how my country and the Armed Forces are projected and perceived, both internally and externally. Coming from an Army family, I understand the angst several people must be going through, because the person they wanted did not make it to the top. However, why do they forget that another professional and capable soldier will be leading the Indian Army for the next three years? The impact of social media messaging on matters of national importance is tremendous. Being hit by negative messages, about how the Indian Army is doomed with this new appointment, people from the Armed Forces’ community influence the psyche of the readers. India's rulers have always had high expectations from Indian science. Nehru said to Indian Science Congress in 1937, "It is science alone that can solve the problems of hunger and poverty, of insanitation and illiteracy, of superstition and deadening custom and tradition, of vast resources running to waste, of a rich country inhabited by starving people." Speaking to the same Congress 79 years later, Narendra Modi asked scientists to concentrate on his five Es: Economy, Environment, Energy, Empathy and Equity. His predecessor, Manmohan Singh, also religiously addressed scientists year in and year out and exhorted them to solve the country's problems. If prime ministers' wishes were horses, Indian scientists would have won the global race long ago. It would be wrong to say that science has nothing to do with the considerable improvement of Indian standards of living: cell phones, for instance, have enabled a majority of Indians to keep in touch with their friends and relatives many miles away; and synthetic materials have made them much better clothed and shod. Once in a while, even an Indian innovation has made a difference - for instance, the autorickshaw, though it was followed very soon by better variants from eastern countries. Why cannot a government dig deep to select an Army Chief of its choice? After all, at this level when it’s down to the top five or six general officers of the Indian Army, there’s little separating them on merit. To become an Army Commander in the cut-throat fauji system is a big deal. So, conventional wisdom is to then just go by seniority but it’s never that simple. Before arriving at any judgment, it’s important to decode this rather secretive and exhausting process, which involves the Intelligence Bureau visiting every location a candidate has been posted. The ritual begins at least six to eight months before the retirement of the incumbent. And interestingly, all eligible candidates — essentially, the Vice-Chief, every Army Commander including the Chief of Integrated Staff Committee if he is from the Army — are considered. The Joint Secretary (G), one of the more pivotal jobs in the Defence Ministry’s bureaucratic labyrinth, prepares a profile of each candidate based on their dossiers, course record and perception. The profiles are meant to cover every detail, starting from the officer’s date of commission till the present. The process then moves to the Defence Secretary, who reviews this and on being satisfied, makes a formal detailed compilation for reference to the Director of the Intelligence Bureau. After Chinese state media warned that war with the United States may be “inevitable,” Beijing has published a policy paper detailing how the military will shift its focus from land and coastlines to the open seas. China’s State Council released a white paper today that criticizes “external countries…busy meddling in South China Sea affairs” and sets out an “active defense” military strategy for the country. The paper comes a day after an editorial (link in Chinese) in the state-run Chinese tabloid Global Times said conflict between China and the US will be unavoidable if the Washington doesn’t lay off Beijing for building islands and military facilities in disputed parts of the South China Sea. The US has been calling on China to halt the construction of entire islands with ports, army barracks and at least one air strip near the Spratly Islands. The area—one of the world’s busiest shipping lanes and home to fertile fishing grounds as well as possibly oil and gas—is the focus of overlapping claims by China, the Philippines, Malaysia, Vietnam, Taiwan, and Brunei. China recently deployed one of its H-6 bombers on a long-range patrol of the Nine-Dash Line that it claims marks the extent of its territorial waters in the Pacific Ocean. The flight was made in response to remarks by President-elect Trump suggesting that the United States might abandon its long-standing policy towards Taiwan and recognize the island as an independent country. As such, the patrol was an almost flattering imitation of the U.S. Air Force’s practice of flying enormous B-52 bombers by countries that have aroused Washington’s ire as a means of broadcasting threat and registering displeasure. Take, for example, a B-52 overflight of waters claimed by China one year ago. China, Russia and the United States are the only countries to operate long-range strategic bombers in significant numbers. Like the American B-52 or Russian Tu-95 Bear currently in service, the H-6 dates back to the early 1950s. Up to 180 H-6s have been produced over the years, the majority of which continue to serve in the People’s Liberation Air Force (PLAAF) and Naval Air Force. Unlike China’s newer warplanes, the cruise-missile toting bomber has actually been tested in battle. On June 26, 2016, here in Panama, the country celebrated the official opening of a new set of locks allowing the transit of Neopanamax vessels, the supersized cargo ships that service the global supply chain from Shanghai to Miami. Since its launch, with the transit of the SS Ancon in 1914, the Panama Canal has served as a testament to American power, ambition, and technological capacity. After more than $5 billion spent, and nearly decade of construction, Panama hopes the new canal expansion will usher in another century of international trade and economic prosperity. Given changes in trade patterns and increasing importance of the Asia-Pacific region, it is perhaps fitting that the first ship to transit the expanded locks – the M.V. COSCO Shipping Panama – hails from the world’s largest trading nation, China. In addition to some notable controversies, the canal expansion has had an inauspicious inauguration. According to the Canal Authority, 2016 has been one of the worst years for maritime cargo, largely due to a slowdown in China and decreasing levels of imports into the United States. Can Trump Shake Up the South Caucasus? The South Caucasus states followed the U.S. presidential election carefully, due to their expectations of the next leader occupying the White House. Since the collapse of Soviet Union in 1991, the existence of powerful Armenian lobby groups, Georgia’s endeavors to become a Western ally and Azerbaijan’s energy resources, as well as the role of trade and energy transit between East and West, have all attracted U.S. attention to the region. The South Caucasus is one of the world’s most tumultuous regions, because of three spots of conflict (Nagorno-Karabakh, Abkhazia and South Ossetia). In the light of geopolitical transformations in the region, U.S. involvement there is of high importance for local states with expectations that the United States will support their independence and sovereignty. In 2016, all three South Caucasus states marked their twenty-fifth anniversary as independent actors in the international community. In the ensuing twenty-five years, various issues have had direct or indirect effect on the United States’ South Caucasus policy. The foreign-policy priorities of U.S. administrations, the region’s geostrategic importance for U.S. interests, the United States’ relations with neighboring Iran and Russia, the enlargement of NATO, the Nagorno-Karabakh conflict between Armenia and Azerbaijan, and the closed border between Turkey and Armenia (closed in 1993 due to the Nagorno-Karabakh conflict) all have enormous impact on the United States’ bilateral relations with regional states and its foreign policy towards the South Caucasus. The West has a double standard when it comes to Africa. This week brought news that Bashar al-Assad’s regime had regained control of the Syrian city of Aleppo. The actual conditions on the ground have been difficult to discern, given the extensive use of propaganda by both sides, but Aleppo appears to have become the kettle of death and destruction that observers feared it would, even if evacuations are now taking place. The wrenching knowledge that abstract civilians are perishing has led many to invoke the Rwandan Genocide—Syria is becoming “another Rwanda,” as one UN envoy put it back in October. You don’t have to downplay the carnage in Aleppo to judge that a specious comparison. The mass killings that ravaged Rwanda back in 1994 ended approximately 800,000 lives over a three-month span; the Syrian Civil War has been raging for more than five years, yet even the most alarming estimates put its death count shy of half a million. And while the Rwandan Genocide took place amidst the backdrop of a civil war, it was not itself an internecine conflict, waged by factions over land or representation or ideology. It was the baseless victimization of one ethnic group by another, the systematic slaughter by Hutu extremists of Tutsis and moderate Hutus. There’s a reason PBS made a documentary called “Ghosts of Rwanda” and UN general Roméo Dallaire titled his account Shake Hands with the Devil: the slaughter was so sudden, inexplicable, and betokening of mass madness, that its witnesses could only draw upon the supernatural. That puts Rwanda in a special category, one that can’t be drawn around every bloody battle. The Skipjack-class submarines were arguably the first truly modern postwar submarines of the U.S. Navy. Combining two new innovations—a new high-speed hull design and nuclear power—the innovative, fish-shaped subs were the basis of all future American submarines up to the present day. The United States Navy officially entered the Nuclear Age on September 30, 1954. That was the day the USS Nautilus, the first nuclear-powered attack submarine ever produced, entered service. Powered by a S2W reactor, Nautilus had a virtually unlimited striking range. Nautilus was a technological triumph, heralding a new age in submarine warfare. Although successful, Nautilus was a one-of-a-kind, proof-of-concept boat. The Skipjacks, with their improved S5W pressurized water reactors, introduced nuclear power to the bulk of the fleet. The S5W was a highly successful design that produced fifteen thousand shaft horsepower and was the standard U.S. Navy reactor until the introduction of the S6G reactor that powers the Los Angeles class. The reactor was also provided to the United Kingdom, where it powered the Royal Navy’s first nuclear powered warship, HMS Dreadnought. AS OUTRAGE SWELLS over Russian hacks against Democratic targets throughout the presidential election, panic over Kremlin meddling has led to a form of short-term amnesia: To paraphrase Orwell’s 1984, “America is at cyberwar with Russia. America had always been at cyberwar with Russia.” It’s easy to forget, meanwhile, that as recently as last year China, not Russia, was America’s ultimate digital nemesis, and seemed like it always would be. In fact, the last year has seen a little-discussed but dramatic drop in Chinese state-sponsored hacking, particularly for intrusions targeting private companies. As the US government searches for a response to Russia’s election-focused hacking both here and elsewhere, the cybersecurity consultants and government officials who have battled both countries’ state-sponsored hackers say that the recent China success story offers lessons about how to deter Russia’s attacks—and also that applying the same deterrence against Moscow won’t be easy. After months of looming terror of a potential third world war, the U.S. and Russia are now on the brink of an open cyber war. While it can be speculated that such a war would involve targeting and disrupting important digitized infrastructural components of the enemy, the world is yet to experience an open cyber war of this magnitude. So what exactly can be expected? 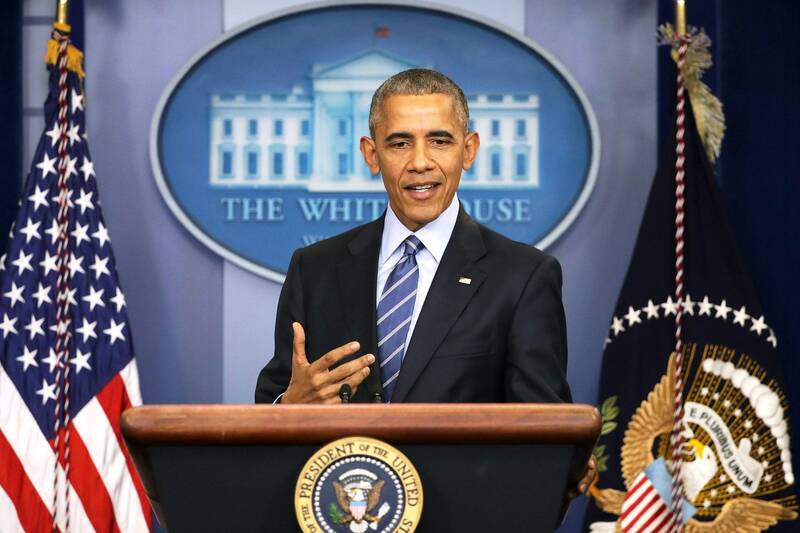 President Obama warned earlier this week that the U.S. would be retaliating against Russia after reports confirmed that they were actively involved in hacking the Democratic emails during the election. It was concluded by intelligence officials that the hacking was a clear attempt to influence the results of the election in favor of President-elect Donald Trump. Experts believe that the U.S. has been slow in developing a clear playbook as on how to respond to cyber attacks. The president, however, spoke on Friday about how the U.S. is more vulnerable to cyber attacks compared to Russia. KYIV, Ukraine—Ukraine’s May 25, 2014, presidential election was a pivotal moment for the country. A revolution that February, in which more than 100 died, had overthrown pro-Russian President Viktor Yanukovych. Two weeks prior to the election, on May 11, pro-Russian separatists in the eastern Ukrainian cities of Donetsk and Luhansk declared their independence from Kyiv. At the time of the vote, separatist forces, receiving weapons and financing from Moscow, were on the march, taking town after town across eastern Ukraine. The country as a whole was still reeling from the body blow of losing the Crimean Peninsula to Russia that March. And with a war brewing in the east, Ukraine’s new pro-Western government was under pressure to cement its legitimacy and restore faith in the democratic process. There were fears of an all-out Russian invasion or a combined offensive by pro-Russian separatists and Russian regulars advancing as far as the Dnieper River, cleaving Ukraine in two. How Desert Storm taught us all the wrong lessons. In the heady days following the spectacular U.S. victory over Saddam Hussein’s Republican Guard armored divisions in Operation Desert Storm, military experts in Washington celebrated the fact that the U.S. military was vastly superior to every armed force on the planet. Even officials and experts in Russia and China grudgingly acknowledged the claim. President George W. Bush declared that the “specter of Vietnam” had been authoritatively vanquished with the stunning military victory in Kuwait. Twenty-five years later, however, the only thing that was vanquished appears to have been objective analysis. The unequivocal military success may have resulted in a dangerous strategic defeat for the United States. On this date in 1990, I was a second lieutenant with the Second U.S. Armored Cavalry Regiment (2ACR) in the Saudi port city of Jubail, feverishly preparing my armored fire support vehicle for the coming ground campaign against the Iraqi troops that had invaded Kuwait the previous August. 2ACR had been designated as the vanguard of the U.S. VII Armored Corps, ordered to lead theater commander Gen. Norman Schwarzkopf’s armored thrust into Saddam’s strongest combat divisions, the Republican Guards, in northern Kuwait. I had been an officer in the Army barely a year. OPEC may have just saved America’s energy revolution. The oil cartel’s December 10 announcement that it had struck a landmark deal with Russia and other major non-OPEC oil producers to curb production sent prices soaring. Brent crude gained more than 4 percent to $56 a barrel and U.S. West Texas Intermediate climbed to nearly $54 after the first global production cut in fifteen years between countries accounting for roughly 60 percent of global output. The deal, which pledged to curb production by 558 thousand barrels a day, followed an agreement made two weeks earlier between OPEC members to slash 1.2 million barrels a day starting in January 2017. Those involved hope the cuts will see the two-year long slump in crude prices finally come to an end, and with Brent crude reaching an 18-month high following the announcement, the agreement already appears to be working. Prices have doubled from their January 2016 floor, when resource markets were in a global funk. A global business empire raises the question: will the next president’s foreign policy serve America’s interests or his own? From close neighbors in Latin America to European allies in the fight against the Islamic State, Donald Trump has international entanglements like no previous commander in chief. Each of the president-elect’s business endeavors, critics say, offers an opportunity for foreign leaders and other actors to unduly influence U.S. policy through emoluments — or potentially, even extortion. Keeping track of Trump’s national-security conflicts-of-interest will be no simple matter, observers say, unless and until he creates a truly blind trust for his assets. Though some potentially profit-inflected decisions have already attracted critical scrutiny, others have surfaced only in the international press, and still others may remain hidden by the Trump Organization’s opaque operating style. What follows is as complete an accounting of Trump’s overseas financial interests as could be gleaned from open-source reporting, including the financial disclosure form he filed as a presidential candidate. Released by the Federal Election Commission, the form is light on details but provides broad estimates of Trump’s assets, income, and debt for the year ending May 2016. WASHINGTON — Over the past four months, American intelligence agencies and aides to President Obama assembled a menu of options to respond to Russia’s hacking during the election, ranging from the obvious — exposing President Vladimir V. Putin’s financial ties to oligarchs — to the innovative, including manipulating the computer code that Russia uses in designing its cyber weapons. But while Mr. Obama vowed on Friday to “send a clear message to Russia” as both a punishment and a deterrent, some of the options were rejected as ineffective, others as too risky. If the choices had been better, one of the aides involved in the debate noted recently, the president would have acted by now. In his last weeks in office, that Situation Room debate has confronted a naturally cautious president with a complex calculus that President-elect Donald J. Trump will soon inherit: how to use the world’s most powerful cyberarsenal at a moment when the United States, as the election showed, remains highly vulnerable. Today, the Department of Defense (DOD) is coming to terms with trends forcing a rethinking of how it fights wars. One trend is proliferation of and parity by competitors in precision munitions. Most notable are China’s antiship ballistic missiles and the proliferation of cruise missiles, such as those the Islamic State of Iraq and the Levant claimed to use to attack an Egyptian ship off the Sinai in 2014. Another trend is the rapid technological advances in artificial intelligence (AI) and robotics that are enabling the creation of learning machines. Failure to adapt and lead in this new reality risks U.S. ability to effectively respond and control the future battlefield. However, budget realities make it unlikely that today’s DOD could spend its way ahead of these challenges or field new systems fast enough. Consider that F-35 fighter development is 7 years behind schedule and, at $1.3 trillion, is $163 billion over budget.1 On the other hand, China produced and test-flew its first fifth-generation fighter (J-20) within 2 years. These pressures create urgency to find a cost-effective response through emergent and disruptive technologies that could ensure U.S. conventional deterrent advantage—in other words, the so-called Third Offset Strategy. The greatest unknown for U.S. interests in the world might be the United States itself. Over the last several years, concern about a particular threat to the United States has been steadily rising in a survey of American foreign-policy experts and government officials by the Council on Foreign Relations. On an annual basis, hundreds of respondents estimate the likelihood and impact on U.S. interests of 30 possible conflicts in the coming year. These conflicts are then divided into three tiers of risk to the United States or its closest allies. The poll is an attempt to help U.S. policymakers prioritize dangers in a dangerous world. In the 2013 and 2014 surveys, respondents wrote in the potential for Russia to interfere in former Soviet states including the Baltic countries, which, like the United States, are members of NATO. In 2015, the scenario appeared for the first time among the survey’s 30 “contingencies,” with an “unintentional or deliberate military confrontation” between Russia and NATO member states regarded as a second-tier risk. This year it was considered a first-tier risk, according to the latest survey, released Monday. A conflict in 2017 between one of the world’s most powerful militaries and the world’s most powerful military alliance was judged moderately likely and high-impact. “Why did you translate Machiavelli, if you didn’t see the point of translating Boccaccio?” Since I wrote about my decision not to retranslate The Decameron, a number of readers have asked me this question. I had explained that I turned down the invitation to retranslate Boccaccio’s wonderful stories because it seemed impossible in modern English to give the text the life and credibility it has both in the original, but also in John Florio’s marvelous version from 1620. Not only was Florio himself a genius, but one senses that the English of his time was closer than ours to the spirit of the events described; it was drenched in religious reference and he was able to say things easily that seem forced or false in our idiom today. 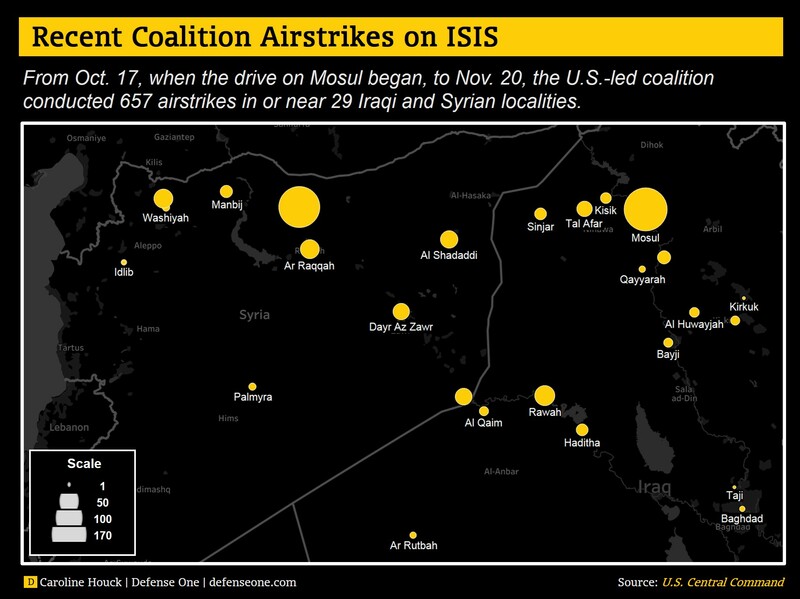 The U.S.-led air war against the Islamic State in Mosul, Raqqa, and the region, visualized. The 12,633-plus airstrikes conducted by U.S. warplanes against the Islamic State underline what U.S. Air Force chief Gen. David Goldfein said at last week’s Defense One Summit: Airpower is central to today’s counterterrorism wars. Coalition partner aircraft have contributed another 3,658 strikes since the war on ISIS in Iraq and Syria began in August 2014, according to data released by U.S. Central Command. The Trump administration enters office in an unsettled time. For a variety of reasons (some directly connected to Trump’s rhetoric), the great powers face more uncertainty than at any time in recent memory. In the first few months of Trump’s presidency (indeed, perhaps even before his presidency begins) the United States will have to navigate several extremely dangerous flashpoints that could ignite, then escalate, conflict between the US, Russia, and China. Reportedly, President Obama suggested to President Trump that North Korea policy would represent the first big test of his administration. North Korea continues to build more and more effective ballistic missiles, as well (most analysts suspect) to expand its nuclear arsenal. While the economy and political system remain moribund, the state itself has shown no inclination to collapse. Moreover, South Korea has mired itself in a serious political crisis of its own. Conflict could erupt in any of several ways; if the United States decides to curtain North Korea’s ballistic missile programs with a preventative attack, if North Korea misreads US signals and decides to preempt, or if a governance collapse leads to chaos. As was the case in 1950, war on the peninsula could easily draw in China, Russia, or Japan. The gray zone is an operating environment in which aggressors use ambiguity and leverage non-attribution to achieve strategic objectives while limiting counter-actions by other nation states. Inside the gray zone, aggressors use hybrid tactics to achieve their strategic objectives. While hybrid threats have historically been associated with irregular and conventional warfare, their use in the gray zone leads to a dichotomy between two types of hybrid threats that can mainly be attributed to the need for ambiguity and non-attribution in the gray zone. The two types of hybrid threats are “open-warfare hybrid threats” and “gray-zone hybrid threats.” A case in point is Russia’s military actions in eastern Ukraine, part of what the Kremlin calls its “New Generation Warfare.” In this MWI report, Capt. John Chambers draws on this case study to recommend ways the US Army can improve its capacity to counter ongoing as well as future gray-zone hybrid threats. Capt. John Chambers is an instructor of American politics in the Department of Social Sciences at the US Military Academy at West Point. The views in this report are the author’s and do not represent those of the Department of Defense or the US Army. The French government has launched a new cyber command unit that will have offensive as well as defensive capabilities to defend itself on the "new cyber-battlefield". France has this week unveiled a new cyber-warfare unit aimed at increasing its cyber-defence and offence capabilities. Cybercom will employ 2600 cyber-security experts by 2019 and receive an initial commitment of €2.1 billion (£1.77bn) in funding. France's defence minister Jean-Yves Le Drian in announcing Cybercom said that it was the country's response to the realities of a new style of warfare, on a par with the use of aircraft in the early 20th century. "The emergence of a new area, a new cyber-battlefield, must make us rethink profoundly our way of approaching the art of war," Le Drian said. Under the new doctrine of war, a cyberattack could constitute an act of war, necessitating an “appropriate response” from Cybercom. France might hold states responsible for any hacking activity that came out of their country if it was found that they hadn't taken steps to stop them. We are supposed to believe that Russian President Vladimir Putin and U.S. President-elect Donald Trump have a budding bromance, as it is called, because Trump made a few off-hand comments during the campaign. And so the trope now is that Putin so preferred Trump that he may have even helped hack a salutary election outcome? If you want to ask our intelligence agencies what’s going on, let’s try an intelligent question. What single thing matters the most to Russia? It is money, not rhetoric. To imagine that any Russian leader, never mind Putin, would be swayed more by the appearance of conversational bonhomie than by hard cash is, to put it kindly, silly. Four facts illuminate the realities of where Russia’s preferences reside. All of the salient information emerges from petroleum domains. First, the price of oil matters to Russia. Half of Russia’s gross domestic product and more than 70 percent of its export revenues come from selling oil and natural gas. That money not only powers the Russian economy, it is key to that nation’s ability to finance expensive foreign adventurism from the Middle East to Ukraine. Today’s low prices are depriving Russia of more than $150 billion every year; even in Washington, that’s real money. But in equivalent terms, that would be like wiping $1.5 trillion from the U.S. economy. 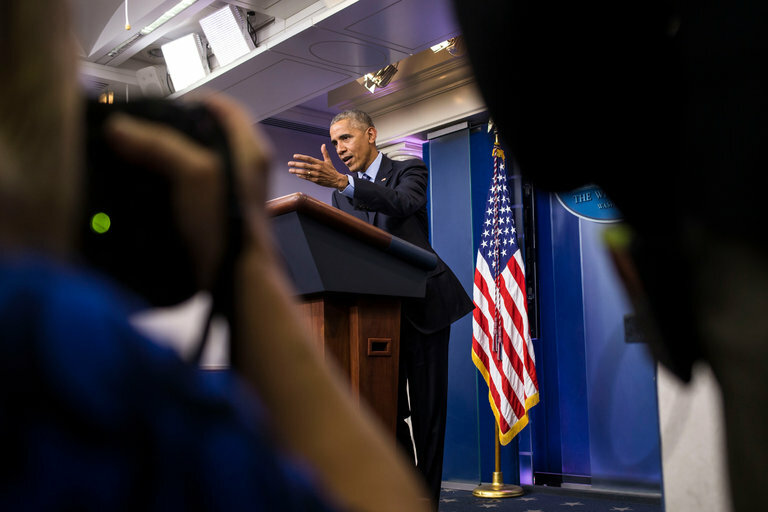 President Obama has been shamefully derelict in making Putin pay a price for his aggression. It’s time to give Vladimir a taste of his own medicine. Vladimir Putin’s tenure as Russia’s dictator has been dedicated to twin interlocking goals: to enhance his own power and wealth and that of the country he controls. The more powerful Russia becomes, after all, the more powerful its president becomes, too. In pursuit of more influence, Putin has tried to rebuild the Russian armed forces from a force of low-quality conscripts equipped with weapons that don’t work to a high-quality professional force with cutting-edge weapons. That transformation, only partially complete, has been shown off in Syria, which Putin has used as a showcase for systems including sleek Kalibr cruise missiles and the smoke-belching aircraft carrier Admiral Kuznetsov. But as befits an old KGB man, Putin’s heart appears to lie more with “deniable” covert operations rather than with overt muscle-flexing.